I love life. I just don't like my own. Crumbling Loaf really should be a sitcom: one of those typical British inertiacoms, the blocked engine of which is the fact that the lead character has just enough vision to be discontented with his lot, but not enough drive to achieve escape velocity. (And the gender designation is no accident here: it's always a he, isn't it, whether it be Tony Hancock, Steptoe, Shelley...) The sad revelation, kept just out of their conscious awareness but constantly informing it, is that their life - that fetid swamp of statis - is the way it is because, in some sense, they want it like that, it's their desire that calls the tune, that returns them to a square one they profess to loathe. The name 'Crumbling Loaf' is packed with the pathos and bathos that Sean has combined into his signature mode. It's loaded with semantic freight: 'loaf' meaning both 'brain' (in the colloquial - 'Use Your loaf') and lethargic ('to loaf' around). 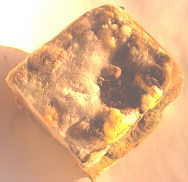 The crumbling loaf in the breadbin - sandpaper-dry and flecked with mould - as a metonymic symbol of the single life (it's always impossible to eat fresh bread before it goes off when you live on your own). 'Crumbling' evokes the gradual, barely perceptible but nonetheless unavoidable sense of decline and disintegration that afflicts us thirtysomething males every time we cower away from the mirror. The Crumbling Loaf generation as the new version of Slacker?